Perhaps due to the fact that I’ve so far this week, spent more time on the London underground than anything else, alongside other countless commuters in our attempt to hold the optimum pathway for the flow of wind that turbines its way through the carriage window, that I’ve drawn attention to such a theme as gaps. 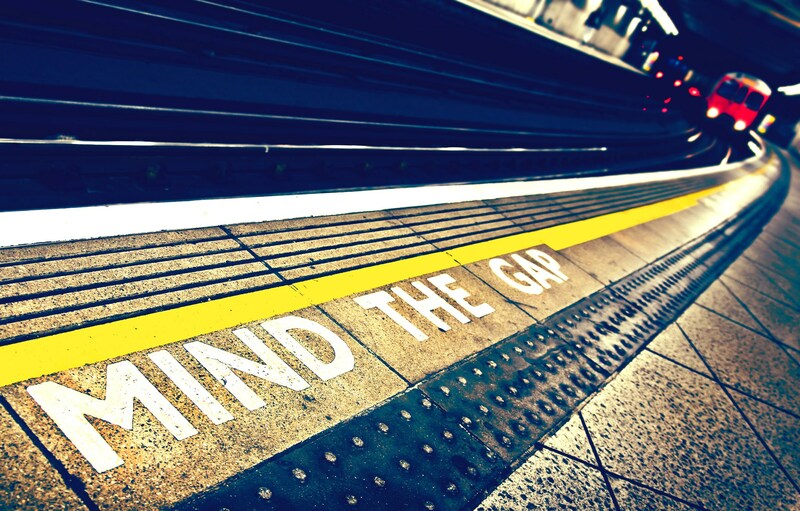 Though the TFL workers make every attempt to make the daily herding of cattle through the platform as smooth and ‘clear of the closing doors’ as possible, the continual use of the phrase ‘mind the gap between the train and platform’ must surely just come out of their mouths involuntarily now. But at least their children will probably never fall down a hole in their life. I’ve clearly become so caught up in the whole ‘London Commuting Life’ – and I love it. That besides, instead of trains and platforms, I’ve began noticing the safety in gap size between my thigh… and my other thigh, whereby there’s probably no need for a TFL worker to announce to ‘mind the gap’ any more. Recently becoming a stupid and non-achievable beauty ideal, the thigh gap is supposedly associated with physical attractiveness, yet really, achieving a thigh gap for most people is next to impossible as it is physically unnatural, and generally is a body shape goal of extreme dieting, surgery, and, would you believe, eating disorders. Exercising endlessly on all that power fuel of apples and bananas (ha! ), my body soon started eating its way through the space between my legs causing the sought after thigh-gap. Obviously, my mind-set took me into jubilation because I was getting thinner and thinner, and I won’t deny the small satisfaction that came when sitting down with my phone in my hand that when dropped, fell through my lap and on to the floor. My phone clearly didn’t listen to the TFL’s instructions. Knowing that such a feature of a women’s physique is scientifically attributed to being unnatural, makes the realisation a lot easier to accept as the gap continues to close on my own body. Plus, who’s to say that the extra mass around my thighs is not also ploughing its way to my buttocks. Katie-1, ED-0.